R to L (Japanese Style). 21+ volumes. Somewhere between science, magic and art lies Fullmetal AlchemistTwo brothers on a quest to find the Philospher’s Stone - Meet Edward and Alphonse Elric. Two brothers endowed with the power of alchemy. In the war between science and magic—the future of the world belongs to 2 brothers. Edward and Alphonse: Alchemy be thy name! In an alchemical ritual gone wrong, Edward Elric lost his arm and his leg, and his brother Alphonse became nothing but a soul in a suit of armor. 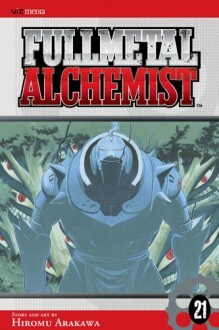 Equipped with mechanical "auto-mail" limbs, Edward becomes a state alchemist, seeking the one thing that can restore his brother and himself...the legendary Philosopher's Stone. A diabolical trap is set for President Bradley... If he is assassinated, a power vacuum will open that Mustang and his allies will be more than happy to fill. Then, while Ed is reunited with someone from his past, Al is separated from his body--his proxy armor body! Now who is filling his heavy metal shoes...? Plus, take a break from all the alchemical intrigue and homunculus backstabbing at the annual Resembool Spring Sheep Festival!